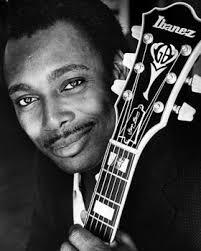 George Benson (1943) is an American jazz guitarist and singer/songwriter. He began his career has a pure jazz guitar player (Influenced by Wes Montgomery and Charlie Christian) and then headed toward to smooth jazz and pop world music. He left an indelible imprint in the world of jazz guitar due to its mastery of bebop language. He is widely known for playing on Ibanez GB signature model guitars, including the GB30TH, GB200, GB15, GB10 .He also plays with D'Angelico, Guild (in the past) and Gibson L-5. George Benson uses Fender amps, Fender Hot rod deville, Fender twins and also Polytone mini-brutes. He has his signature model George Benson Hot rod deluxe 40 W.
These pages are regularly updated, please do not hesitate to register for the newsletter. This lesson is about a George Benson line transcribed from a tune called last train to Clarksville by the Monkees. This short guitar tutorial explain what's the mixoblues scale, a mix between the minor blues scale and the Mixolydian mode.